The government has requested all investors attending the ongoing Investment Summit to invest in Nepal. 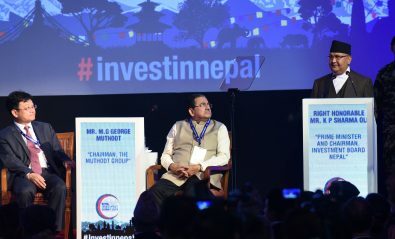 Addressing the Summit that began here today, Minister for Finance Dr Yubraj Khatiwada said Nepal has become an appropriate place for investment with the procedural and institutional reforms in this regard. He also referred to politically favourable environment and formation of government at all three levels. “Affordable tax rates have been fixed and laws made targeting investors. There is possibility for investors to have a big market in Nepal standing between big countries China and India. I want to urge all investors to invest and get high returns on their investment,” he said. Vice president of the Asian Development Bank Shixin Chen said investments had already been made in energy, drinking water, town infrastructure and education of Nepal, and strategies had been made for more investments. He referred to the Bank’s investment in Melamchi Drinking Water Project, Gautam Buddha International Airport. “Plans have been made to make long-term investment in Nepal,” he said. Likewise, Hartwig Schafer, Vice president of the World Bank for the South Asia Region, expressed his readiness to invest in Nepal so as to help its goals of ‘Prosperous Nepal, Happy Nepali’, stating that is environment conducive for investment in Nepal lately with some changes in legal structures in this regard. He also expressed his willingness to cooperate with the private sector of Nepal. U Thaung Tun, Minister for Investment and Foreign Economic Relations of Myanmar, suggested that Nepal should focus on agriculture to boost its economy while referring to progresses it has achieved in poverty alleviation, trade increment and attracting foreign investment. Similarly, chairperson of the Muthoot Group, M.G. George Muthoot said a favourable environment has been created in Nepal for investment with the formation of a stable government. He said that the government has been working to become economically strong, saying it has made commitment to bring in foreign investment. Addressing the summit, former Finance Minister Dr Ram Sharan Mahat said that the private sector in recent period has made big achievement in telecommunication and energy sectors, presenting the fact that private sector has been encouraged in Nepal for investment after 1990. The former Finance Minister said that Nepal faced big problems like political instability and earthquake in last two decades, adding that Nepal has now reached to a new place after coming out from all these problems. He further said that Nepal has been continuously achieving success in human development index, saying only 15 per cent population is now under poverty line in Nepal. Saying it was the high time for economic development, former Finance Minister Mahat said that foreign investment was necessary for the same. Discussion would be held on investment opportunity in Nepal today itself during the summit. As per the schedule prepared by IBN, discussion would also be held on ‘Energy and Information Technology’ and issue of development of women and youth entrepreneurship this afternoon. Various projects on agriculture, hydropower, industry, tourism, transport, urban infrastructure, education and health sectors are being presented at the summit that runs till Saturday. The projects are worth between Rs. 640 million to 350 billion. Nepal government ministers, Chief Ministers of all the seven States, non-resident Nepalis, and the private sector representatives are also taking part in the summit.